(Nanowerk News) On a quest to discover new states of matter, a team of Princeton University scientists has found that electrons on the surface of specific materials act like miniature superheroes, relentlessly dodging the cliff-like obstacles of imperfect microsurfaces, sometimes moving straight through barriers. The Princeton work represents the first time such behavior of electrons has been tracked and recorded, and hints at the possibilities of speeding up integrated circuits that process information by flow of electrons between different devices. The new materials potentially could break the bottleneck that occurs when metallic interconnects get so small that even the tiniest atomic imperfection hinders their performance. Physics professor Ali Yazdani and his team observed the extraordinary physics behavior in a "topological surface state" on a microscopic wedge of the metal antimony. The work is reported in the July 15 issue of Nature. This view provides a look into the heart of a scanning tunneling microscope in the specially designed Princeton Nanoscale Microscopy Laboratory, where highly accurate measurements at the atomic scale are possible because sounds and vibrations, through a multitude of technologies, are kept to a minimum. Normally, electron flow in materials is impeded by imperfections -- seemingly slight edges and rifts act like cliffs and crevasses in this microscopic world, blocking electrons in their path. Recent theories, however, predict that electrons on the surface of some compounds containing elements such as antimony can be immune to such disruptions in their flow. The connectivity in their flow, Yazdani said, stems from a special form of electron wave that seemingly alters the pattern of flow around any imperfection. Many of the "topological" materials, such as antimony, have been important in the world economy; however, their unusual surface conduction previously had not been examined. Part of the challenge had been the difficulty in measuring the flow of electrons just at the surface, a task that was accomplished by the Princeton group using a specialized microscopy technique that enables precise visualization of electrons at the surface of materials. "Material imperfections just cannot trap these surface electrons," said Yazdani, whose pioneering explorations of the behavior of electrons in unusual materials in his Jadwin Hall laboratories has consistently yielded new insights. "This demonstration suggests that surface conduction in these compounds may be useful for high-current transmission even in the presence of atomic scale irregularities -- an electronic feature sought to efficiently interconnect nanoscale devices." An electron is a subatomic particle that carries a negative electric charge. It orbits an atom's nucleus and is bound to it by electromagnetic forces. Electrons can hop between atoms in a limited number of materials, such as crystals, and move freely in their interior or on the surface. These free electrons are responsible for the generation of electric current, playing a central role in numerous applications related to industry, science and medicine, including providing the current for modern electronic devices. For most metals, electrons in the interior carry most of the electrical current, with the electrons at the surface being only weakly mobile. At a given temperature, materials possess a measurable conductivity that determines the intensity of electric current. Metals such as copper and gold are good conductors, allowing for the rapid flow of electrons. Materials such as glass and Teflon, with structures that impede electron flow, are poor conductors. The atoms of metals have a structure allowing their electrons to behave as if they were free, or not bound to the atom. The work by the Princeton team is part of an ongoing inquiry into materials called topological insulators -- substances that act as insulators in their interior while permitting the movement of charges on their boundary. In a phenomenon known as the quantum Hall effect, this behavior occurs when there is a perpendicular magnetic field applied to the material. And, in work conducted internationally by several researchers -- including a group led by Princeton physics professor Zahid Hasan -- a new type of topological insulator has been uncovered in which this behavior occurs even when there is no magnetic field present. The crystals for the work were grown in the laboratory of Robert Cava, the Russell Wellman Moore Professor of Chemistry at Princeton. The antimony crystal used in the experiment led by Yazdani is a metal but shares the unusual surface electron characteristics with related insulating compounds. Because the electrons are able to move freely on the surface of the experimental material regardless of the shape of that surface, the material has a "topological surface state," Yazdani said. Topology is a major area of mathematics concerned with spatial properties that are preserved despite the deformation, like stretching, of objects. In that regard, a doughnut and a coffee cup can be viewed as topologically the same because they both are essentially areas with holes in the middle. With lab instruments, the team was able to measure how long electrons are staying in a region of the material and how many of them flow through to other areas. The results showed a surprising efficiency by which surface electrons on antimony go through barriers that typically stop other surface electrons on the surface of most conducting materials, such as copper. Authors on the paper include: Yazdani; postdoctoral fellows Jungpil Seo and Haim Beidenkopf; graduate student Pedram Roushan; and, along with Cava, his former postdoctoral fellow Yew San Hor, who is now at the Missouri University of Science and Technology. Yazdani's team worked in the specially designed Princeton Nanoscale Microscopy Laboratory, where highly accurate measurements at the atomic scale are possible because sounds and vibrations, through a multitude of technologies, are kept to a minimum. They used a powerful scanning tunneling microscope to view electrons on the surface of the antimony sample. In such a microscope, an image is produced by pointing a finely focused electron beam, as in a TV set, across the studied sample. Researchers gently scan the microcope's single-atom sharp metal tip just above the surface of the material being studied. 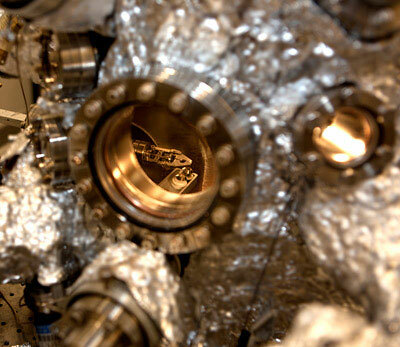 By monitoring the quantum "tunneling" of electrons flowing from the needle into the sample, the instrument can produce precise images of atoms, as well as the flow of electron waves. The experiment, Cava said, "shows for the first time that the theoretically predicted immunity of topological surface states to death at the hands of the ever-present defects in the atomic arrangements on crystal surfaces is really true."